Most of the people in my business would probably say the same thing if they were to be asked about those on foot as well. With tourism at a record high and the economy in the Big Apple in decent shape, there’s never been more of them to contend with during a shift. For the record, I haven’t hit one yet but I’ve had enough close calls that I still haven’t completely mastered the art of dodging them with ease. I don’t mean to bash them – after all, I learned my way around New York by being one for many years as well, since I hardly ever drove in from my humble suburbs of New Jersey. I could count the number of times I brought my vehicle across the Hudson River in the 15+ years between the obtainment of my driver’s license and my hack license. Thankfully, I was able to get a lay of the land via foot before getting behind the wheel for a living on a nightly basis. The average walker in Gotham has had it better than ever in recent years. While traffic fatalities remain a problem, they are in the news more than ever now and with the new mayoral team set to take office late next week, pedestrian safety already seems like it will move to the forefront of issues that need to be addressed. Yes, there will always be taxis that jump the curb and people racing around way too fast in the wee hours of the morning but the changes that have been implemented lately are already a harbinger of what’s to come. And nowhere is this more apparent than on the Great White Way. For those unfamiliar with the street grid in Manhattan, Broadway is the major exception to the orderly layout of thoroughfares from the Commissioner’s Plan of 1811. North of Houston Street, there were to be 12 major Avenues running north-south and 155 total Streets running east-west, which was later extended upwards as more of Manhattan became settled. Older thoroughfares like Greenwich Ave. and the Bowery would remain in place but for the most part, the plan that was drawn up was remarkably close to the one that was laid out. Central and Gramercy Parks filled in some of the streets with a superblocked green space and the topography of the northern part of the island dictated that some streets (like 116) would not be able to stretch from river to river. Mother nature also showed some resiliency over mankind’s attempt in impose an order of enlightened rationality, without having to tear apart the existing urban fabric like what was done in Paris by Baron Haussmann. Although part of the Village was indeed demolished to make way for the southern extension of 6 and 7 Ave’s in the early 20th Century, very little changed when it came to the layout of Manhattan’s arteries, unless one takes into the account the reworking of the Avenues into one-way streets in the 1950’s. That was until Mayor Bloomberg came along. Led by Transportation Commissioner Jeanette Sadik-Khan and City Planning Commissioner Amanda Burden, many thoroughfares were remade into “Complete Streets” during his 12 years as Mayor. Inspired by European cities, autos would no longer gain precedence when it came to deciding how the space on a given street would be utilized. Widening streets would no longer be an option, traffic calming measures would be implemented, and for the second time (the first being under Mayor Koch in 1980), bike lanes would be added to allow for the easier and safer movement of two-wheeled non-motorized vehicles. Hardly a week goes by now where someone at my garage isn’t complaining about bikes flying the wrong way down the lanes, traffic caused by them, or tickets being given out by the NYPD because a passenger wanted to be discharged in a lane and someone had a quota to fill that day. Toss in the addition of protected bus lanes on 1, 2, and Lexington Ave’s and the midtown bus lanes on Madison Ave being expanded from rush hours to all hours, and the ripple effect from the changes ended up affecting more than just those who had to make a living on the same streets that were becoming less and less spacious for motor vehicles. So where did Broadway fit into all of this? To put it simply, it didn’t. Broadway would be closed off to all traffic. This didn’t take place along the entire length of it but through Times and Herald Squares, Broadway would no longer flow through them as it did for generations. There was significant outcry at first as drivers bemoaned the loss of more street space and were fearful of increased traffic on parallel routes. Even though this change was made before I started my current occupation, I could see that some of these fears were justified. Times Square is a complete mess now, as the increased space given for sidewalks has been nowhere near enough to compensate for the massive expansion in retail and office space that recent rezoning has allowed for. It’s torn apart nearly every night and since only one street flows out of it now, backups are quite common well after Midnight on most nights, when most of the rest of the City has quieted down. As for 6 Ave, it flows better through Herald Square as the green phase on the lights is longer than it was when Broadway still went through it. While it is a plus, most of the rest of the Avenue of the Americas still gets congested during rush hours as the office buildings along it empty out and the buses jockey along the right-hand side of the street to get ahead of each other. Where Broadway still messes up the pulse of the City is in front of Lincoln Center, as it has to content with Columbus Ave and 65 St for valuable green time where they all cross. 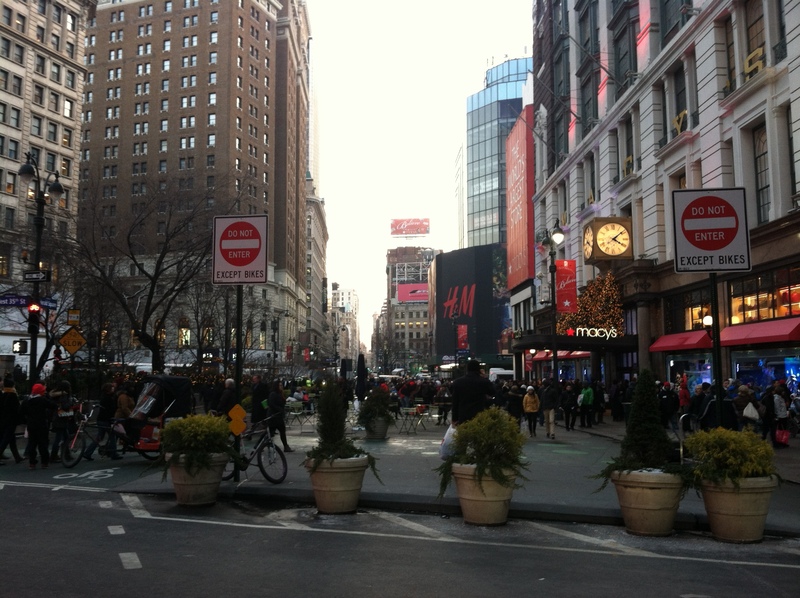 Since Broadway is a two-direction street north of Columbus Circle, further changes are not likely along it. Where changes will be seen is in how those outside of Manhattan will get from Point A to Point B. The concept of Select Bus Service, which allows for express buses in dedicated lanes has taken off in the Outer Boroughs in the last few years and will probably be expanded under Bill de Blasio. If it gets people out of their vehicles, that’s great but already there has been an outcry along Nostrand Ave in Brooklyn as only *one* lane can now be used by cars that make their way down it. As New York grows in population and more people move to those Outer Boroughs, the ideas that first took root in Manhattan will branch out down major streets one by one. The difference is that Manhattan has a density seen in only a few other places on the Earth, while the Outer Boroughs have a lot more room to work when it comes to converting the layout of the streets there. Subways and until recently, metered Taxi service are lacking in many commuter and immigrant neighborhoods which has made the expansion of buses the preferred method of mass transit growth throughout much of the City. While many in Manhattan asked for SBS, many outside of it haven’t and it remains to be seen whether complete streets will be opposed more as the program takes off any further. Social engineering was easier in crowded Manhattan but in a less dense environment, would the conversion be met as receptively? Thankfully, I don’t have to worry about that as the county known as New York still remains my home base and the one that I’ve gotten to know the best. One of the reasons I loved walking around it when I was still getting to know the layout of neighborhoods was that the traffic was so bad, and this was before the boom in tourism, drop in crime, and growth in people returning to New York from the suburbs led to more vehicles on the streets of the Big Apple. The number of yellow cabs has been capped for years, even though that’s set to change as more Outer Borough Taxis are added to the mix and the 1,500 medallions that were recently sold come online. It’s only a matter of time before Bus and bike lanes are expanded and more turn restrictions are added along the two-way crosstown rues like 23 and 34 Sts. Of course, emergency vehicles and the NYPD can turn wherever they want, but who’s going to ever pull *them* over? I couldn’t imagine having to learn Manhattan by foot now, as Citi Bikes have permeated into every nearly nook and cranny south of Central Park and the attitudes of those riding them have threatened to make even the most relaxed of cabdrivers want to teach them a lesson or two. The calmness of backwater neighborhoods has been replaced by a frenzy that will only see temporary dips during the next recession, only to grow even further as upzoning results in more people needing to get around with less room to do so. Someday when I’m not driving anymore, I’ll pick up where I left off in the ’90’s and set to re-explore what I can on foot. It won’t be the same as then, as everyone has their heads buried in their phones now and would rather let their apps be their brains instead of learning in ins and outs of neighborhood nuances on their own. I will fight the good fight and do my best to go where I want when I want, as more plazas, fences, security barriers, and closings will be put into place, all in the name of “security”, “flow”, “throughput”, and “efficiency”. The City I grew up with is still the one I desperately hold onto, even as it’s being remade into a playground for those who are totally unaware of the way things used to be. I know full well that I can’t go back, but I’ll refuse to go go forward without being dragged into the future. I can only hope that the planners and leaders of tomorrow take into account all modes of transit and show consideration for those who need to make a living on the street, no matter how they choose to get around. 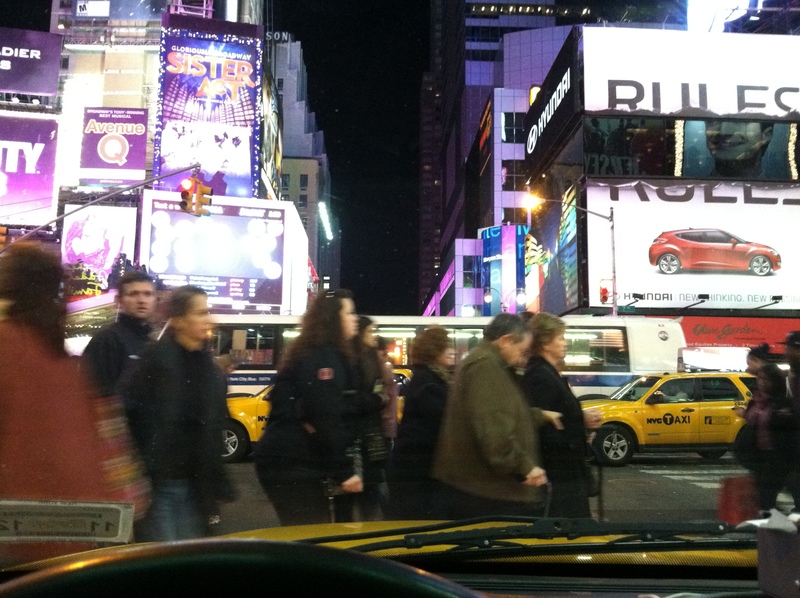 This entry was posted in Uncategorized and tagged Broadway, neighborhoods, pedestrians, Streetscapes, Times Square.